Some folks say that everything tastes better when it’s cooked out in the backcountry. 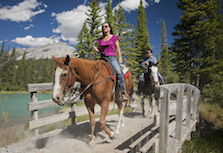 From juicy steaks grilled over a campfire to grilled salmon served with freshly roasted vegetables – all the food served during a Banff Trail Riders’ trip is prepared by talented cooks who are masters of backcountry cuisine. Here’s a taste of the authentic Old West: dig into a juicy AAA Alberta steak paired with home-made baked beans, baked potatoes and other fixings. Somehow, the mountain vistas make this meal taste even more delicious. Even miles away from civilization, our backcountry chefs are able to prepare some surprisingly sophisticated meals. Large, well-equipped kitchens and talented cooks are key to the great food at both our Sundance Lodge and Halfway Lodge. You can savour everything from braised beef short ribs to Crème Brulee Cheesecake. And in the winter, we add new items to the menu at Sundance Lodge designed to keep you warm and toasty, like fondue or butternut squash ravioli. It’s rustic comfort food taken to a whole new level.